There is a popular urban legend according to which during the space race of the 1960’s, NASA spent substantial resources on developing a special pen for Astronauts that could work in a zero gravity environment. Instead of spending exorbitant amounts of money on a Cosmonaut’s pen, the Russians simply used pencils. While this is more fiction than fact, it represents that manner in which NASA’s brand altered throughout the 1970’s and 80’s. Following President Kennedy’s declaration that the US would commit itself to putting a man on the moon by the end of the 1960’s, NASA became one of the most important agencies in the US government. Putting a man on the moon transformed from a national goal to a national security imperative when the Soviet Union announced its intention to arrive at the Sea of Tranquility first. The technological fete now facing NASA required the recruitment of the finest minds in America. The human fete, of breaking the last barrier known to man, required the recruitment of the finest men in America. Since reaching the moon was a national goal, Astronauts were revered as national heroes. When not operating lunar modules they appeared in schools, churches and on the front pages of newspapers. Parades were thrown in their honor on Fifth Avenue. NASA was not only a scientific agency; it was a public relations agency. In today’s vernacular, NASA may be regarded as one of the most important smart power resources the US developed during the Cold War. Smart not only because it was at the forefront of scientific and technological discoveries, but because it became synonymous with America and the “American Spirit”. Astronauts were the new pioneers attempting to conquer the final frontier. 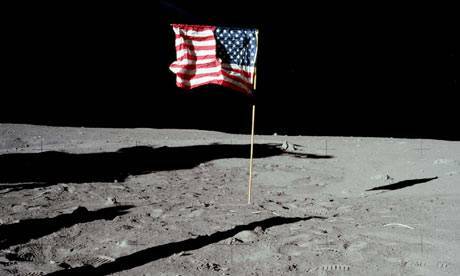 And on July 20th, 1969, America made it to the moon, both as a nation and as a superpower. The world watched as American astronauts, baring the American flag, left an American space craft and walked on the surface of the moon. On that day, Americans became our world’s first galactic diplomats. This was an important moment in the so called “American century” for it was an American that took one giant leap for all mankind. However, during the 1970’s and 80’s, brand NASA quickly lost its appeal. The moon had been reached, the race was over. Americans quickly interest in space and in 1972 NASA stopped voyages to the moon. During the 1980’s, space lost its innocence. Reagan’s dream of weaponizing space hurt NASA’s brand as anti-nuclear weapons activists now turned their gaze to the stars. Suddenly, NASA had transformed from a smart power resources to a financial drain. But it was the Challenger disaster of 1986, the agency’s first disaster to be televised and captured live, that turned NASA into a PR burden. Resources were cut, budgets were slashed. By the end of the century, rather than have an American land on Mars, NASA was sending faulty rovers and telescopes into space. NASA’s image went from a technological pioneer to an old man unable to use modern technology. While brand NASA suffered, brand America continued to prosper as it emerged victorious from the Cold War. In 1991 there was only one superpower left in the world, and it did not need a flag posted on a distant planet to prove it. Then came the 9/11 terrorist attacks, the Bush-esque division of the world to those who support America and those who support terrorists, the global war on terror and the invasions of Afghanistan and Iraq. To many around the world, both Muslims and non-Muslims, both in the Middle East and in Europe and Asia, America was now a greedy, polluting militaristic empire. This was the crisis in brand America. In 2009, John Quelch and Katherine Jocz, penned an article titled “Can Brand Obama Rescue Brand America?”. Lamenting the decline in the US’s global image, the authors suggested that the election of Barack Hussein Obama might signal a shift in the perception of America. Calling on the President to address the moral blemishes on the US’s image, the writers drew a road map through which brand Obama could rescue brand America. But despite Obama, brand America has yet to be revived to its former glory. While its image is now much better than it was during the Bush years, anti-American sentiment is still high in the Middle East and in other regions. And while it is no longer in Iraq or Afghanistan, America is still engages in a global war on terror and a culture clash with the Muslim world. Last week, saw a glimmer of hope for brand America from the planet Pluto. On July 14, the New Horizons spacecraft sent a last batch of images back to NASA, including the best picture of Pluto ever recorded. True to the age of digital diploamcy, NASA which operates a social media empire consisting of 500 accounts, uploaded the picture to its Instagram account and history was made. Millions of people on earth saw Pluto for the first time from their smartphone screens. The virtual greeting from Pluto was not the first time NASA has used social media. In fact, the agency has a well-planned social media strategy that includes twitter Q&As, public engagement and continuously updating information from Astronauts, rovers and telescopes. 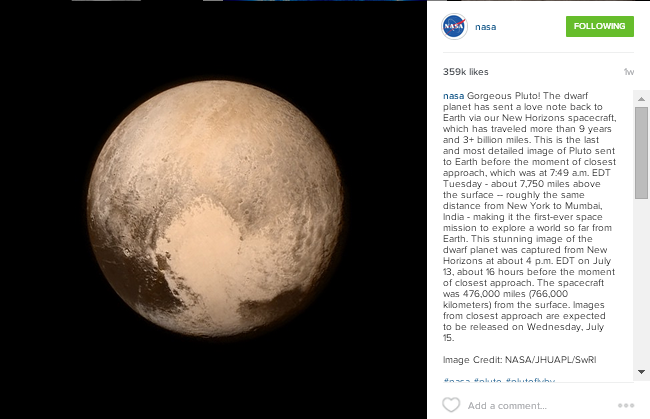 While it already has millions of followers, NASA gained more than 300,000 new Instagram followers immediately after publication of the Pluto picture (present company included). In his article on NASA’s use of social media, Wired’s Nick Stockton writes that “NASA is a #brand”. But NASA has always been a brand. What has enabled the brand’s recent resurgence is a tech savvy approach to social media that has introduced NASA to a new audience of millions to whom science and technology is appealing-young people. 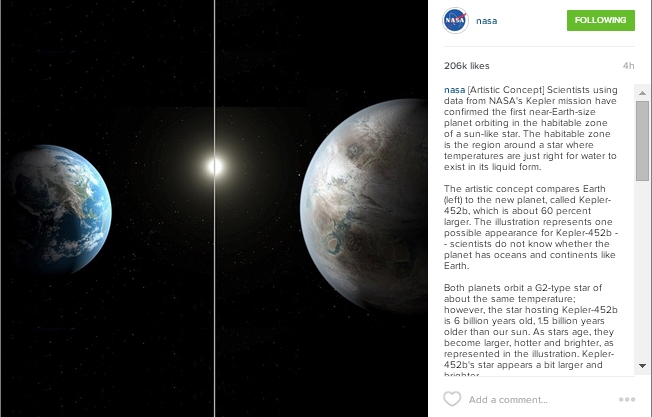 NASA also used Instagram to introduce people to Kepler-452b, earth’s twin. Using web 2.0 to acquaint the world with Earth 2.0 was another masterstroke that soon caught the attention of the world. In Israel, coverage of a major political speech was cut mid-way in order to show images from NASA’s Instagram feed. The stunning images of Earth 2.0, located more than 1,400 light years from earth, also captivated people’s imagination. Is NASA at the forefront of another monumental achievement-finding life on other planets? And if so, is NASA once again our planetary foreign office? For brand America, NASA’s rise may prove beneficial. Rather than leading yet another coalition in another war on terror, the US may be seen as leading mankind on another great quest. If brand NASA becomes attractive again, can this impact brand America? Will NASA have a halo effect on Brand America, an effect that brand Obama has yet to elicit? That would depend greatly on whether the US is ready to have NASA serve as its PR agency yet again. At the moment, many people seem to forget that NASA is a US agency and part of the US government. NASA’s logo on social media does not include the small US flag that was always patched onto Astronauts uniforms. Brand NASA can only aid brand America if foreign policy makers are willing to once again associate NASA with America and the American spirit. Posted in Uncategorized and tagged America, Brand America, branding, Digital Diplomacy, diplomacy, NASA, Nation Branding, Public Diplomacy, Space. Bookmark the permalink.